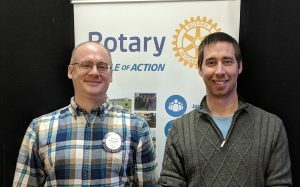 In this photo are Houlton Rotarian Travis Glatter with the Houlton club President Nate Bodenstab. Glatter spoke at the January 14, 2019 meeting about the work of the Rotary Foundation and how it is really based on community to community effort. The Houlton club does so much and so well to advance the six areas of focus to help the world that the foundation supports. These are world peace, disease prevention, water sanitation, maternal and child health, promoting basic education and literacy and economic and community development. More information can be found at Rotary.org.